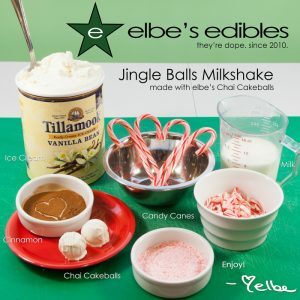 In a blender add Vanilla Ice Cream, Whole Milk, Cinnamon, and broken pieces of Candy Canes. Mix on pulse or high for 20-30 seconds. Crumble up the Chai Cakeballs and add to the blender. Blend on high until completely mixed, about 30 seconds to 1 minute. Dip rims of cups into milk or water and press into Candy Cane dust. 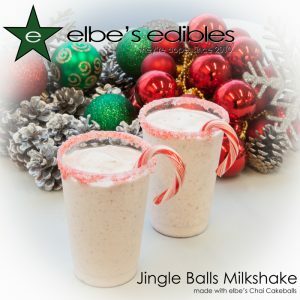 Pour your Jingle Balls Milkshake into 2 large glasses and add Candy Cane decorations for a 15mg drink (use 4 glasses for 7mg each of yumm! ).